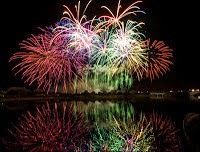 Lake Tahoe offers several places to view spectacular firework shows. The water pollution lawsuit that could have marked the end of Tahoe fireworks shows has been resolved. The shows will go on, but with some oversight to make sure lake clarity is maintained. Show organizers will be required to clean-up spent firework shells that fall into the water. If you have a boat, you can view all of the shows at once. Bring warm clothing and float around for awhile. Stateline Nevada: “Lights on the Lake” is one of the biggest shows in the nation. Best beaches are Nevada, Reagan, El Dorado, and Edgewood-Tahoe Golf. Mount Tallac provides a unique perspective. Fireworks begin at 9:45pm. Check for simultaneous music broadcast on KRLT FM 93.9. Tahoe City: Commons Beach. Show starts at dusk for more than 60 years. Kings Beach: Kings Beach State Recreation Area. Limited tickets for the recreation area. “Beach Party” starts at 4pm, fireworks after dark. July 3, 2014. Incline Village: The “Red, White, and Tahoe Blue Festival” will have a fireworks display near Incline and Burnt Cedar beaches at 9:30pm. The fireworks will shoot higher and farther from the shore this year. Donner Lake, Truckee: West End Beach is an all day party with music (tickets required). Fireworks at 9:30pm. Visible from all around Donner Lake and Donner Summit. 4. Stop down shutter to f/8 or smaller. Lake Tahoe is one of the world's spectacular mountain lakes sitting at an altitude of 6,229 feet. It is framed by the magnificent Sierra Nevada Mountains. We have enjoyed doing a variety of activities in the Lake Tahoe area before our boston new york washington dc tour. We have enjoyed Lake Cruises as well as renting a small boat and exploring the lake ourselves. We have enjoyed exploring the lake by driving around it. We have fished it. There are a lot of places for biking and hiking. There are great places for picnics. There are marvelous lake side restaurants such as Edgewood in South Lake Tahoe.